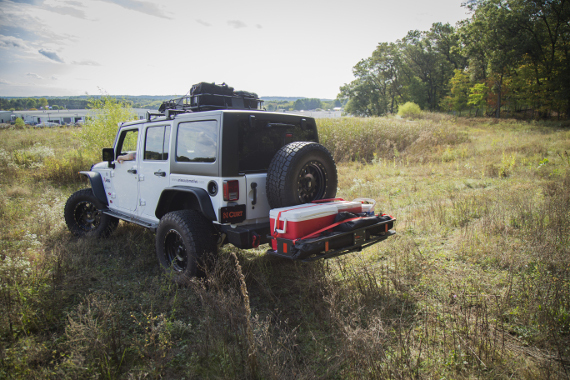 Cargo tie down straps are a versatile and reliable way to keep your cargo fully secure for whatever adventure lies ahead. We offer cargo straps with cambuckles for light-duty applications and ratchet cargo straps for heavy-duty applications. Unsecure cargo is not only a danger to you, your passengers and your fellow adventurers on the road, but it can also cause damage to your trailer, pickup truck bed or vehicle cargo area, as well as to the cargo itself. CURT cargo straps are perfect for securing any type of cargo, offering more convenience and dependability compared to ropes or bungee cords. CURT cargo straps with cambuckles are the ideal solution for light-duty cargo. The cambuckle mechanism is simple to operate for quick cinching, and it allows for direct tension on the load. This allows the user to feel how tightly the cargo strap is pulled across the item, making it easy to handle lightweight or even fragile items with care. CURT cargo ratchet straps use a ratcheting mechanism to apply greater tension on large, heavy loads. Once threaded, the ratchet allows the strap to be tightened down, locking it into place with each cycle. Ratchet cargo tie down straps are available in multiple lengths, capacities and hook styles to provide the exact solution needed for your truck, trailer and cargo.